West Hampstead Life | Is Abercorn School hedging its bets? Is Abercorn School hedging its bets? It’s been several months since Abercorn School announced it was interested in moving into the vacant ground-floor unit at Alfred Court – a formal application has been submitted, but is this just a backup plan? 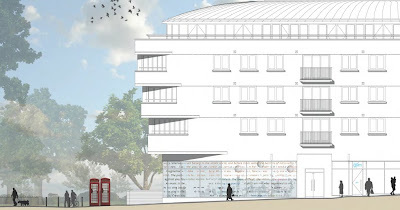 The private school based in St John’s Wood was looking for somewhere to expand and seemed to think that this site, in the modern bulding that overlooks Fortune Green, would be a viable option. Initial resident feedback wasn’t overwhelmingly positive. No formal plans were submitted and people began to wonder whether the idea had been quietly shelved. Then, in late July an application was submitted. You can view the whole document here. Residents have objected in no uncertain terms. Traffic is the big problem and the lengthy transport assessment document that forms part of the application has done nothing to ease locals’ concerns. I’ve added some of the main statistics and a few quotes from residents at the end of this piece. I promised to keep you updated on the expansion issue. We are still waiting on lawyers, planners, etc. but I can tell you that we do hope some time in the next 12 months to move our Wyndham Place pupils (Years 4-8) to magnificent premises on Portland Place. 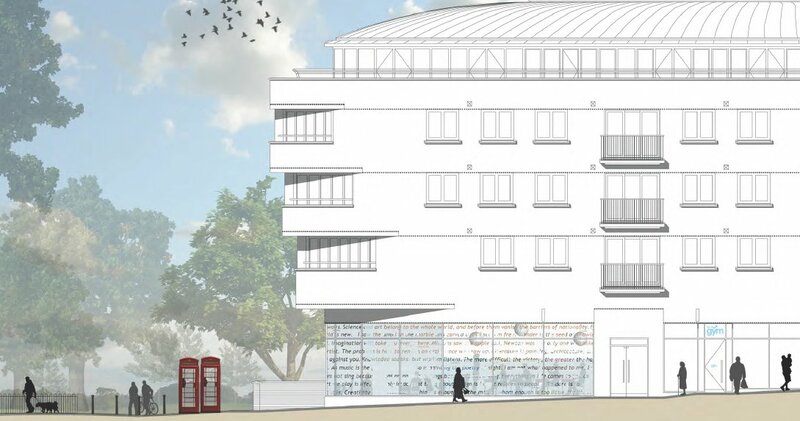 The larger space in that building will enable us to give a much enhanced offering to our older pupils. The exact timing is still uncertain—watch this space!! As you are aware this street is much closer to our existing premises than our previous option, and I hope when we do move, it will prove a seamless transition. Are we meant to infer from this that Fortune Green, which is surely the “previous option”, is now no more than a backup plan or a temporary solution should there be problems with the Portland Place site? I am waiting to hear back from the school on this. It’s also possible that since that letter was sent out the Portland Place site has fallen through so they have had to press ahead with Fortune Green. Either way, something doesn’t quite add up. Talking of not adding up… here are some of the details on the transport situation. If you are a local resident and want to object then there’s plenty to get your teeth into. As a long term resident I have seen traffic and specifically parking problems exacerbate since the Council approved the whole Sager development. Ingham road is used as a parking/drop off place for Tesco customers, gym attendees and the nursery school. 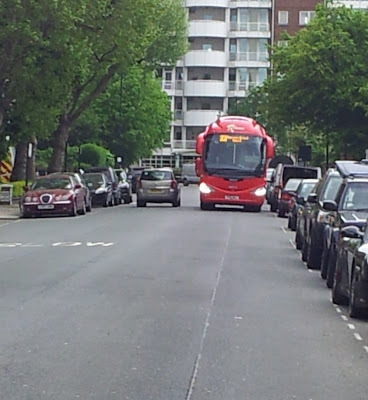 Buses already cannot pass each other due to the unmonitored parking. 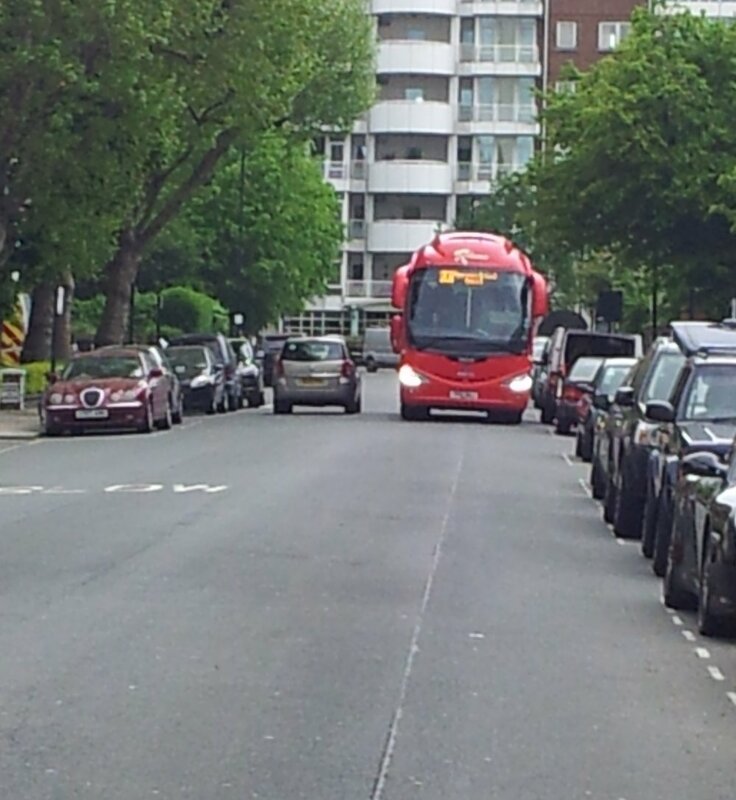 We are already experiencing enormous congestion and parking problems from the users of the Gym on Fortune Green Road as also people who park to shop at the Tesco store on Fortune Green Road. Not only is parking difficult through out the day but jams are caused by the volume of parking on Fortune Green Road and deliveries by Tesco lorries. A school will add still further with the inevitable large numbers of drop off and collections by parents, minibuses and buses. There is simply no capacity for this in an already very congested environment. The transport assessment goes into inordinate detail about the “pick-up/drop-off strategy”, which involves parents driving into the basement car park and number plate recogntiion technology alerting school staff as to which child they have to go and meet (the youngest children are 8, not 5). Hard to imagine that, despite the Bat Cave approach, most parents won’t just drop their kids off as near as they can to the front door rather than go through all that palaver. A school bus would only stop for the minimum time required to pick up or drop off pupils who are accompanied at all times by a teacher on the bus. There is no need for a school bus to wait here. Such punctuality would be astounding. There’s also a strange assumption that all kids coming by public bus would take the 328, but how many actually live near the 328 bus route? Some do, most don’t. This map (click to enlarge) shows at postcode level (not address level) where existing pupils live. You can decide for yourself whether it’s optimistic to suggest that all the kids living where the blue stars are will faithfully take the school bus every day. 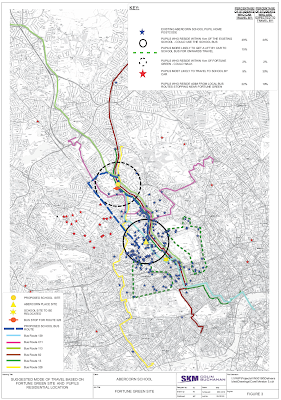 The transport survey is phenomenally detailed, especially if you get into the appendices. However, one group of local residents have retaliated with a pretty detailed assessment of their own that focuses (rather cleverly) less on the issues of traffic congestion and more on the emotive topic of child safety. If you want to express your view to Camden on this, all the details are here. Psychotherapy school heading to Fortune Green? School to move in to Alfred Court?